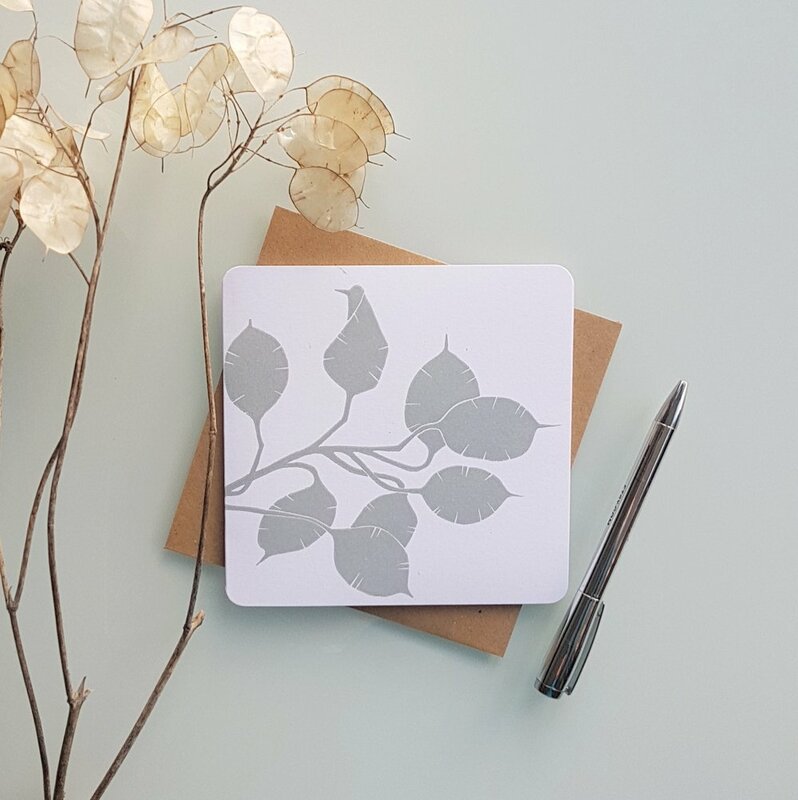 We’re off to the rather lovely city of York on the blog this week, to meet Just A Card campaign supporter, artist and printmaker Carrie of Rose & Hen. Carrie talks about how it can sometimes be best to let your business grow organically, and how important it is to get involved with creative groups in your local community. My name is Carrie Lyall and I’m a contemporary Artist and Printmaker from the beautiful and historic city of York. I sell my artwork through my online Etsy shop, Rose & Hen named after my children, and at various Art Markets and Craft fairs in York. 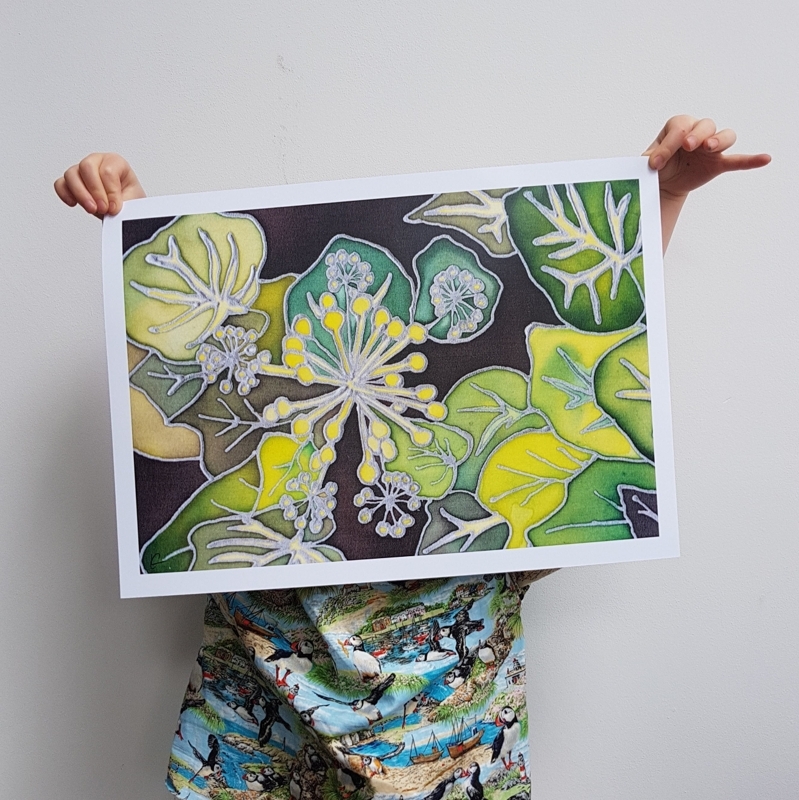 In my Etsy shop you can find botanical inspired prints, cards and sketchbooks, all based on my silk paintings, illustrations and linocut designs. I studied 3D Design at University and until recently, had career in event management. While on maternity leave with my second child I took up painting again and decided to hold an art based MacMillan Coffee Morning, selling cake and cards for charity with my Mum. We did really well, and many people asked if I had ever considered selling my work. I thought “why not”!? Suddenly, I found myself giving up work and booking a stall on the York River Art Market during summer last year. It’s been a bit of a learning curve, but with the support of my family I’ve never looked back. I’m a stay at home Mum with two kids, a 6 year old and a 2 year old. My lovely Mother in Law looks after the little one once a week, while the other is at school, giving me time for my artwork. The rest of the time I work whenever I can, during naptime or in the evenings. My typical work day starts once I’ve dropped my daughter at school and my son has been picked up for the day. 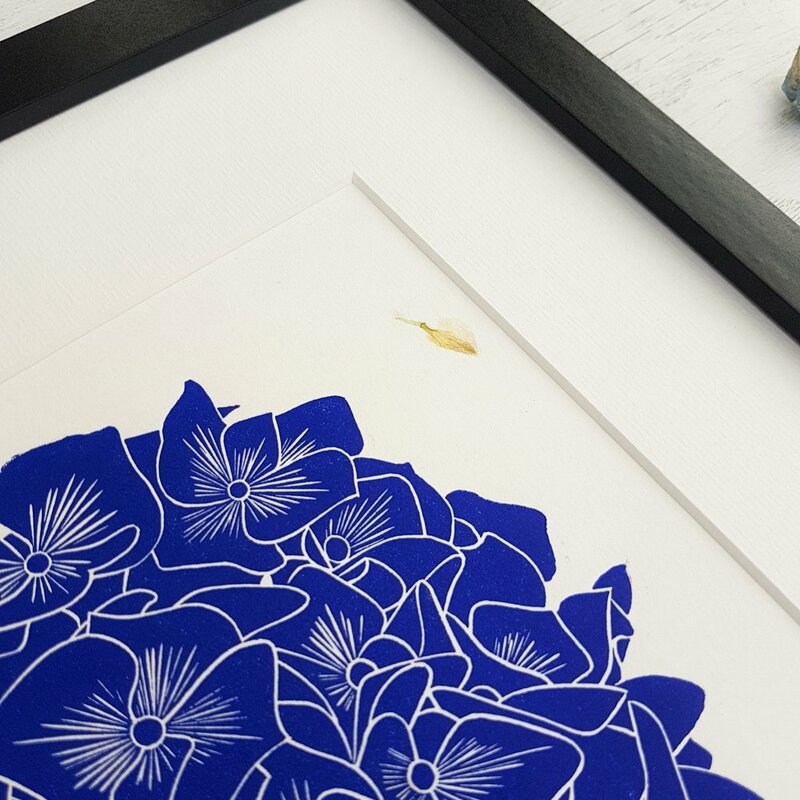 I try to keep my work day specifically for designing and photography, but my favourite days are print days. I have a bit of a ritual to it now, and enjoy the process of setting up my work space, then playing about with the inks. I have a long tempered glass slab which I use for my inks, and a portable press. Everything else goes around the table and I listen to music or have box sets on in the back ground. I can easily lose myself in a few hours of printmaking. As I don’t have a dedicated studio at the moment, I work from my kitchen table. It’s probably my favourite room in the house, as it’s so light and airy. In summer I can sit with the doors open on to the garden and enjoy the lovely weather. I’m generally at my most relaxed when I’m painting or lino cutting, as I find it quite therapeutic. When I’m not working or being Mummy, I like reading, watching Sci-Fi movies and baking cakes. My gin soaked rhubarb and raspberry upside down cake goes down a storm. When I finished my degree, Facebook was in its infancy and web design was all written in HTML code. Then, the hard part was getting noticed outside of you own circle, as online presence was not really the norm. Now, with online shops such as Etsy and the rise of social media, customers have access to anything they want, whenever they want it. So it is more important than ever to tell a story with your social media posts, showing the process behind your products and what makes them special. I’m still only really at the start of my journey as an artist and already have a list as long as my arm of things I’d like to do, including have my own studio. Initially, I’ve been exploring different media to find my voice, so to speak, and teaching myself as I go along. By far linocut has been my favourite, as I’ve always been fascinated with printmaking. I really enjoy having full control over the process, end to end, and it also means that I can ensure my materials are locally sourced. I am a frequent visitor at Hawthorn Printmakers in Murton near York, and love to pop in when I need new inks. It’s like being in a sweetie shop with all those delicious colours. 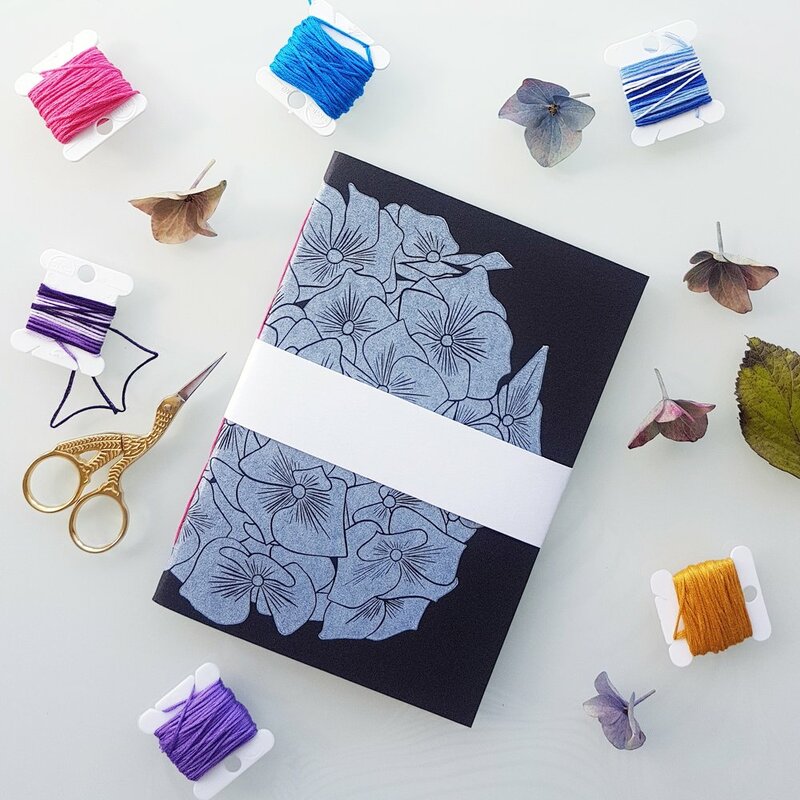 I’d like to make linocut my main focus and I’ve started to expand my range to include hand stitched sketchbooks. I have also recently been approached by some local independent shops about stocking my linocut designs, and was delighted with their feedback. I’ve currently been letting my business grow organically, due to the time I am able to spend working, so in the future when I have more time, I’ll be able to build on these successes. Until then, its baby steps for now. Starting out as a designer maker can be pretty intimidating, and it’s hard not to compare yourself with other artists. My solution has been to surround myself with likeminded and supportive people who understand my hopes and dreams. I joined my local Etsy Team in York and am now a team leader, helping organising fairs and running the Instagram and Facebook page. I’ve also joined the York Printmakers group, attending monthly meet ups and taking part in exhibitions. I find no end of support from these amazing people and highly recommend joining your local creative groups and getting involved. But, most of all, be true to yourself and take it one day at a time. Keep moving forward, celebrate the little things and be proud of what you have achieved! I really love shopping at independent shops and we have some great ones here in York, such as Walter & May, the Owl & Monkey, Paperesque to mention just a few. I also shop online with some fabulous designers I’ve found, such as Claire at Wrixton Smyth. Her jewellery is utterly amazing and I absolutely love my ammonite necklace. Absolutely, and I agree with it whole heartedly. It is simple but true, and can be adapted to other businesses. By encouraging people to buy what they can from local, independent shops and businesses, we ensure they have a future. It’s extremely important, as not everyone can afford to spend a large amount of money of an original piece of artwork, and it often takes a lot of thought even if you are considering buying. The small sales of a card or a sketchbook all add up though, and ensure that I can continue my progress as an artist. I had just joined Twitter last year, and was in another Twitter Hour when someone mentioned Just A Card. I looked it up and I started following on Twitter and Instagram. It has quickly become my favorite place to chat and inspire. I’ve met some amazing designers, makers and artists through Just A Card. I also use Facebook, but I really love Instagram as I’m a very pictorial person and love taking photos. I have a Just A Card sticker and pin badge, which I use at all my fairs. I also make sure all my Etsy Team mates and craft buddies are aware of the campaign, and encourage them to join in. Last Christmas I actively bought gifts from independent sellers rather than big chains, and I’ll be doing the same this year. It’s a great opportunity to find some unique gifts and support independent shops as well.